Smoothened is a protein that in humans is encoded by the SMO gene. Smoothened is a Class Frizzled (Class F) G protein-coupled receptor that is a component of the hedgehog signaling pathway and is conserved from flies to humans. It is the molecular target of the natural teratogen cyclopamine. It also is the target of Vismodegib, the first hedgehog pathway inhibitor to be approved by the U.S. Food and Drug Administration (FDA). Cellular localization plays an essential role in the function of SMO, which anchors to the cell membrane as a 7-pass transmembrane protein. Stimulation of the patched 12-pass transmembrane receptor by the sonic hedgehog ligand leads to translocation of SMO to the primary cilium in vertebrates in a process that involves the exit of patched from the primary cilium, where it normally localizes in its unstimulated state. Vertebrate SMO that is mutated in the domain required for ciliary localisation often cannot contribute to hedgehog pathway activation. Conversely, SMO can become constitutively localized to the primary cilium and potentially activate pathway signaling constitutively as a result of a tryptophan to leucine mutation in the aforementioned domain. SMO has been shown to move during patched stimulation from the plasma membrane near the primary cilium to the ciliary membrane itself via a lateral transport pathway along the membrane, as opposed to via directed transport by vesicles. The cAMP-PKA pathway is known to promote the lateral movement of SMO and hedgehog signal transduction in general. In invertebrates like Drosophila, SMO does not organize at cilia and instead is generally translocated to the plasma membrane following hedgehog binding to patched. After cellular localization, SMO must additionally be activated by a distinct mechanism in order to stimulate hedgehog signal transduction, but that mechanism is unknown. There is evidence for the existence of an unidentified endogenous ligand that binds SMO and activates it. It is believed that mutations in SMO can mimic the ligand-induced conformation of SMO and activate constitutive signal transduction. SMO plays a key role in transcriptional repression and activation by the zinc-finger transcription factor Cubitus interruptus (Ci; known as Gli in vertebrates). 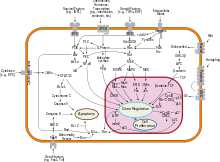 When the hedgehog pathway is inactive, a complex of Fused (Fu), Supressor of Fused (Sufu), and the kinesin motor protein Costal-2 (Cos2) tether Ci to microtubules. In this complex, Cos2 promotes proteolytic cleavage of Ci by activating hyperphosphorylation of Ci and subsequent recruitment of ubiquitin ligase; the cleaved Ci goes on to act as a repressor of hedgehog-activated transcription. However, when hedgehog signaling is active, Ci remains intact and acts as a transcriptional activator of the same genes that its cleaved form suppresses. SMO has been shown to bind Costal-2 and play a role in the localization of the Ci complex and prevention of Ci cleavage. Additionally, it is known that vertebrate SMO contributes to the activation of Gli as a transcription factor via association with ciliary structures such as Evc2, but these mechanisms are not fully understood. SMO can function as an oncogene. Activating SMO mutations can lead to unregulated activation of the hedgehog pathway and serve as driving mutations for cancers such as medulloblastoma, basal-cell carcinoma, pancreatic cancer, and prostate cancer. As such, SMO is an attractive cancer drug target, along with the many hedgehog pathway agonists and antagonists that are known to directly target SMO. Cholesterol is known to be crucial in regulating the overall hedgehog pathway, and congenital mutations in cholesterol synthesis pathways can inactivate SMO specifically, leading to developmental disorders. For example, oxysterol 20(S)-OHC is known to activate vertebrate SMO by binding the cysteine rich domain near its extracellular amino-terminal region. In the context of cancer, 20(S)-OHC is the target of a proposed anti-cancer oxysterol binding inhibitor. ^ Ruiz-Gómez A, Molnar C, Holguín H, Mayor F, de Celis JF (April 2007). "The cell biology of Smo signalling and its relationships with GPCRs". Biochimica et Biophysica Acta. 1768 (4): 901–12. doi:10.1016/j.bbamem.2006.09.020. PMID 17094938. ^ Wang C, Wu H, Evron T, Vardy E, Han GW, Huang XP, Hufeisen SJ, Mangano TJ, Urban DJ, Katritch V, Cherezov V, Caron MG, Roth BL, Stevens RC (July 2014). "Structural basis for Smoothened receptor modulation and chemoresistance to anticancer drugs". Nature Communications. 5: 4355. doi:10.1038/ncomms5355. PMC 4198951. PMID 25008467. ^ Taipale J, Chen JK, Cooper MK, Wang B, Mann RK, Milenkovic L, Scott MP, Beachy PA (August 2000). "Effects of oncogenic mutations in Smoothened and Patched can be reversed by cyclopamine". Nature. 406 (6799): 1005–9. doi:10.1038/35023008. PMID 10984056. ^ "Vismodegib, First Hedgehog Inhibitor, Approved for BCC Patients". OncLive. Retrieved 2017-05-26. ^ Rohatgi R, Milenkovic L, Scott MP (July 2007). "Patched1 regulates hedgehog signaling at the primary cilium". Science. 317 (5836): 372–6. doi:10.1126/science.1139740. PMID 17641202. ^ Corbit KC, Aanstad P, Singla V, Norman AR, Stainier DY, Reiter JF (October 2005). "Vertebrate Smoothened functions at the primary cilium". Nature. 437 (7061): 1018–21. doi:10.1038/nature04117. PMID 16136078. ^ a b c Wang Y, Zhou Z, Walsh CT, McMahon AP (February 2009). "Selective translocation of intracellular Smoothened to the primary cilium in response to Hedgehog pathway modulation". Proceedings of the National Academy of Sciences of the United States of America. 106 (8): 2623–8. doi:10.1073/pnas.0812110106. PMC 2650314. PMID 19196978. ^ Milenkovic L, Scott MP, Rohatgi R (November 2009). "Lateral transport of Smoothened from the plasma membrane to the membrane of the cilium". The Journal of Cell Biology. 187 (3): 365–74. doi:10.1083/jcb.200907126. PMC 2779247. PMID 19948480. ^ a b c d Arensdorf AM, Marada S, Ogden SK (January 2016). "Smoothened Regulation: A Tale of Two Signals". Trends in Pharmacological Sciences. 37 (1): 62–72. doi:10.1016/j.tips.2015.09.001. PMC 4593303. PMID 26432668. ^ Rohatgi R, Milenkovic L, Corcoran RB, Scott MP (March 2009). "Hedgehog signal transduction by Smoothened: pharmacologic evidence for a 2-step activation process". Proceedings of the National Academy of Sciences of the United States of America. 106 (9): 3196–201. doi:10.1073/pnas.0813373106. PMC 2642660. PMID 19218434. ^ Cohen MM (November 2003). "The hedgehog signaling network". American Journal of Medical Genetics. Part A. 123A (1): 5–28. doi:10.1002/ajmg.a.20495. PMID 14556242. ^ Aikin RA, Ayers KL, Thérond PP (April 2008). "The role of kinases in the Hedgehog signalling pathway". EMBO Reports. 9 (4): 330–6. doi:10.1038/embor.2008.38. PMC 2288774. PMID 18379584. ^ Lum L, Zhang C, Oh S, Mann RK, von Kessler DP, Taipale J, Weis-Garcia F, Gong R, Wang B, Beachy PA (November 2003). "Hedgehog signal transduction via Smoothened association with a cytoplasmic complex scaffolded by the atypical kinesin, Costal-2". Molecular Cell. 12 (5): 1261–74. doi:10.1016/S1097-2765(03)00426-X. PMID 14636583. ^ Jia J, Tong C, Jiang J (November 2003). "Smoothened transduces Hedgehog signal by physically interacting with Costal2/Fused complex through its C-terminal tail". Genes & Development. 17 (21): 2709–20. doi:10.1101/gad.1136603. PMC 280620. PMID 14597665. ^ Xie J, Murone M, Luoh SM, Ryan A, Gu Q, Zhang C, Bonifas JM, Lam CW, Hynes M, Goddard A, Rosenthal A, Epstein EH, de Sauvage FJ (January 1998). "Activating Smoothened mutations in sporadic basal-cell carcinoma". Nature. 391 (6662): 90–2. doi:10.1038/34201. PMID 9422511. ^ Blassberg R, Macrae JI, Briscoe J, Jacob J (February 2016). "Reduced cholesterol levels impair Smoothened activation in Smith-Lemli-Opitz syndrome". Human Molecular Genetics. 25 (4): 693–705. doi:10.1093/hmg/ddv507. PMC 4743690. PMID 26685159. Chen Y, Struhl G (November 1996). "Dual roles for patched in sequestering and transducing Hedgehog". Cell. 87 (3): 553–63. doi:10.1016/S0092-8674(00)81374-4. PMID 8898207. Stone DM, Hynes M, Armanini M, Swanson TA, Gu Q, Johnson RL, Scott MP, Pennica D, Goddard A, Phillips H, Noll M, Hooper JE, de Sauvage F, Rosenthal A (November 1996). "The tumour-suppressor gene patched encodes a candidate receptor for Sonic hedgehog". Nature. 384 (6605): 129–34. doi:10.1038/384129a0. PMID 8906787. Xie J, Murone M, Luoh SM, Ryan A, Gu Q, Zhang C, Bonifas JM, Lam CW, Hynes M, Goddard A, Rosenthal A, Epstein EH, de Sauvage FJ (January 1998). "Activating Smoothened mutations in sporadic basal-cell carcinoma". Nature. 391 (6662): 90–2. doi:10.1038/34201. PMID 9422511. Reifenberger J, Wolter M, Weber RG, Megahed M, Ruzicka T, Lichter P, Reifenberger G (May 1998). "Missense mutations in SMOH in sporadic basal cell carcinomas of the skin and primitive neuroectodermal tumors of the central nervous system". Cancer Research. 58 (9): 1798–803. PMID 9581815. Sublett JE, Entrekin RE, Look AT, Reardon DA (May 1998). 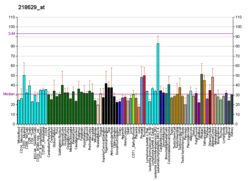 "Chromosomal localization of the human smoothened gene (SMOH) to 7q32. 3 by fluorescence in situ hybridization and radiation hybrid mapping". Genomics. 50 (1): 112–4. doi:10.1006/geno.1998.5227. PMID 9628830. McGarvey TW, Maruta Y, Tomaszewski JE, Linnenbach AJ, Malkowicz SB (September 1998). "PTCH gene mutations in invasive transitional cell carcinoma of the bladder". Oncogene. 17 (9): 1167–72. doi:10.1038/sj.onc.1202045. PMID 9764827. Chidambaram A, Gerrard B, Hanson M, Dean M (November 1998). "Chromosomal localization of the human and murine orthologues of the Drosophila smoothened gene". Genomics. 53 (3): 416–7. doi:10.1006/geno.1998.5531. PMID 9799615. Carpenter D, Stone DM, Brush J, Ryan A, Armanini M, Frantz G, Rosenthal A, de Sauvage FJ (November 1998). "Characterization of two patched receptors for the vertebrate hedgehog protein family". Proceedings of the National Academy of Sciences of the United States of America. 95 (23): 13630–4. doi:10.1073/pnas.95.23.13630. PMC 24870. PMID 9811851. Detmer K, Walker AN, Jenkins TM, Steele TA, Dannawi H (August 2000). "Erythroid differentiation in vitro is blocked by cyclopamine, an inhibitor of hedgehog signaling". Blood Cells, Molecules & Diseases. 26 (4): 360–72. doi:10.1006/bcmd.2000.0318. PMID 11042037. Long F, Zhang XM, Karp S, Yang Y, McMahon AP (December 2001). "Genetic manipulation of hedgehog signaling in the endochondral skeleton reveals a direct role in the regulation of chondrocyte proliferation". Development. 128 (24): 5099–108. PMID 11748145. Incardona JP, Gruenberg J, Roelink H (June 2002). "Sonic hedgehog induces the segregation of patched and smoothened in endosomes". Current Biology. 12 (12): 983–95. doi:10.1016/S0960-9822(02)00895-3. PMID 12123571. Lowrey JA, Stewart GA, Lindey S, Hoyne GF, Dallman MJ, Howie SE, Lamb JR (August 2002). "Sonic hedgehog promotes cell cycle progression in activated peripheral CD4(+) T lymphocytes". Journal of Immunology. 169 (4): 1869–75. doi:10.4049/jimmunol.169.4.1869. PMID 12165511. Taipale J, Cooper MK, Maiti T, Beachy PA (August 2002). "Patched acts catalytically to suppress the activity of Smoothened". Nature. 418 (6900): 892–7. doi:10.1038/nature00989. PMID 12192414. Katayam M, Yoshida K, Ishimori H, Katayama M, Kawase T, Motoyama J, Kamiguchi H (September 2002). "Patched and smoothened mRNA expression in human astrocytic tumors inversely correlates with histological malignancy". Journal of Neuro-Oncology. 59 (2): 107–15. doi:10.1023/A:1019660421216. PMID 12241103. Couvé-Privat S, Bouadjar B, Avril MF, Sarasin A, Daya-Grosjean L (December 2002). "Significantly high levels of ultraviolet-specific mutations in the smoothened gene in basal cell carcinomas from DNA repair-deficient xeroderma pigmentosum patients". Cancer Research. 62 (24): 7186–9. PMID 12499255. Grachtchouk V, Grachtchouk M, Lowe L, Johnson T, Wei L, Wang A, de Sauvage F, Dlugosz AA (June 2003). "The magnitude of hedgehog signaling activity defines skin tumor phenotype". The EMBO Journal. 22 (11): 2741–51. doi:10.1093/emboj/cdg271. PMC 156767. PMID 12773389. Chen W, Ren XR, Nelson CD, Barak LS, Chen JK, Beachy PA, de Sauvage F, Lefkowitz RJ (December 2004). "Activity-dependent internalization of smoothened mediated by beta-arrestin 2 and GRK2". Science. 306 (5705): 2257–60. doi:10.1126/science.1104135. PMID 15618519. Byrne EF, Sircar R, Miller PS, Hedger G, Luchetti G, Nachtergaele S, Tully MD, Mydock-McGrane L, Covey DF, Rambo RP, Sansom MS, Newstead S, Rohatgi R (July 2016). "Structural basis of Smoothened regulation by its extracellular domains". Nature. 535 (7613): 517–22. doi:10.1038/nature18934. PMC 4970916. PMID 27437577. "Frizzled Receptors: SMO". IUPHAR Database of Receptors and Ion Channels. International Union of Basic and Clinical Pharmacology. This page was last edited on 6 March 2019, at 20:54 (UTC).